Hello! 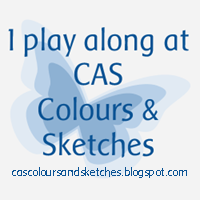 Today marks the beginning of another sketch challenge at CAS – Colours and Sketches. This time Karen has us working with blocks – which really leaves a lot to the imagination as to how you want to use them! I’ve decided to combine this challenge with the Dynamic Duos challenge that ends today. 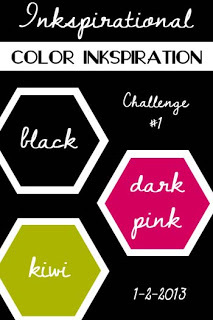 They’re asking us to use soft shades of aqua and pink. 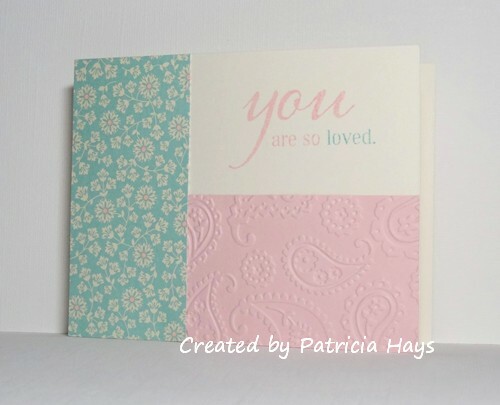 I’ve run some Pink Pirouette cardstock through an embossing folder for the bottom block of the sketch. For the vertical block, I’ve chosen a piece of designer paper that’s Pool Party and Very Vanilla, and colored in the centers of the flowers with a pink marker to tie all the colors together. 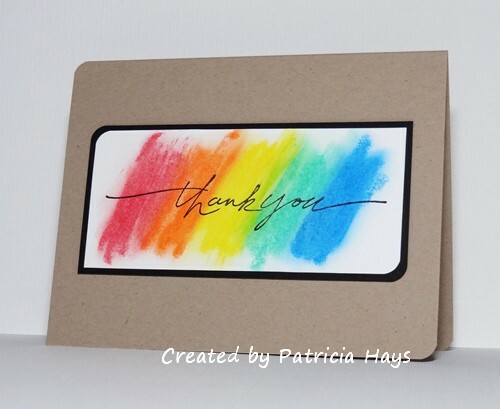 I’ve used both colors to stamp the sentiment so that I could highlight the last word. 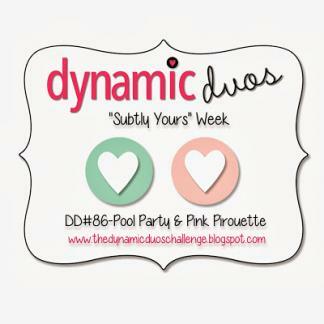 The blocks of color also work for the current CAS-ual Fridays challenge, and the pastel colors tie into this week’s OWH Midweek Throwdown challenge. 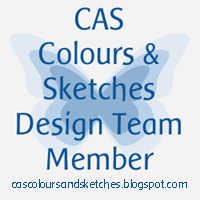 Be sure to check out what the rest of the CAS – Colours and Sketches design team did with this sketch. Then show us what you can make with it! 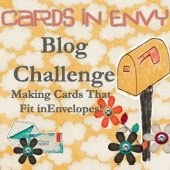 You can link your card to the challenge blog until 1:00 p.m. eastern time Wednesday, January 29. Thanks for stopping by today! Here’s a card I put together quickly this morning to get it into a few of my favorite online challenges. 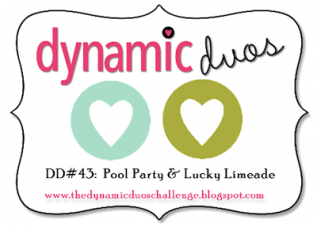 The layout is from CAS – Colours and Sketches challenge #22 and the color scheme comes from Dynamic Duos challenge #50. 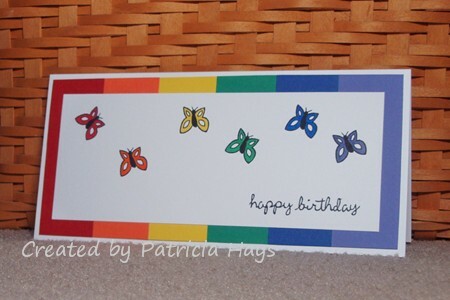 I chose to make a birthday card to fit in with CAS-ual Fridays challenge #99, and the butterfly embellishments fit the theme for the current Cards in Envy challenge. It’s not one of my favorite cards I’ve ever made, but it’ll be fine for Operation Write Home! Actually, now that I think about it, I’m going to go back and add either some pearls or some rhinestones to the butterflies to dress them up a bit. 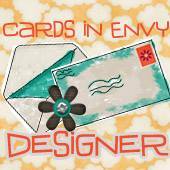 Posted by PH in VA at 11:00 am Cards, Cards in Envy, CAS Colours & Sketches, CAS-ual Fridays challenges, Dynamic Duos, Operation Write Home, Stampin' Up! 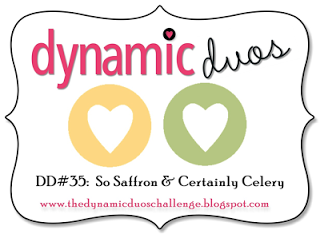 So as I was working on cards to fill up the box I sent to OWH this week, I came across this week’s CAS-ual Fridays challenge. 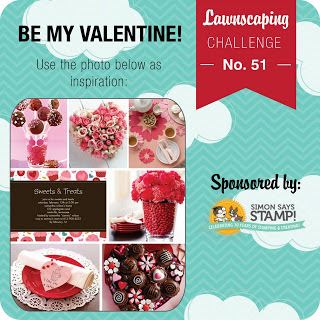 This time they are asking the challenge participants to create a card using no stamps. Zero. Zilch. Nada. 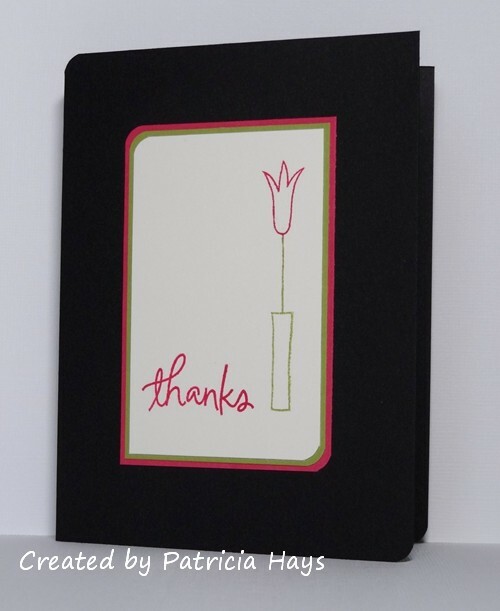 I needed some thank you, birthday and thinking of you cards for OWH. 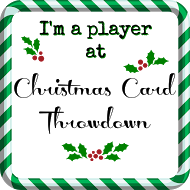 So I decided I’d try to create a no stamps card for one of those categories. I looked through my rub-ons, but wasn’t liking anything that I was coming up with along that line. Then I thought about using some of my dies. Bingo! I remembered one of my sets of Cuttlebug alphabets contained the word “thanks”. So I pulled it off the shelf and chose to use that along with the vase and floral images in that set. Picking the colors didn’t take long; I had actually used these colors together on a card about 5 years ago. (And as I’m typing this post, I realize that all of the SU colors are retired.) 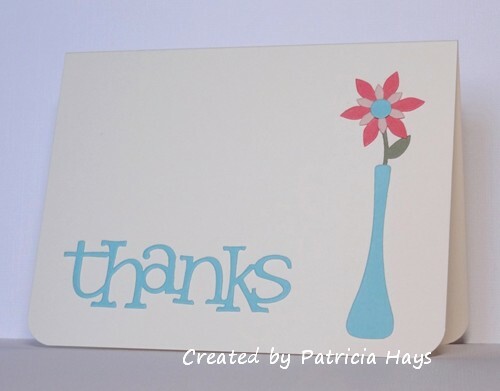 Once I figured out how to fit everything on the card front (the vase and flower ended up taller than I realized at first, so I snipped a bit off of the flower stem) and ran it through my Xyron, I had a reasonably quick one-layer card. So, that’s another card for my latest shipment to OWH. I’ll have another one to share later today. 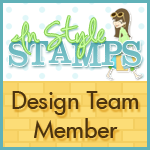 Posted by PH in VA at 12:00 am Cards, CAS-ual Fridays challenges, Operation Write Home, Stampin' Up! You’ve probably heard the expression “When Life gives you lemons, make lemonade.” There’s also a version where you combine the lemons with tequila and salt and make margaritas. But if neither of those is your style, today’s card might have the solution for you. I first saw the sentiment I used on today’s card about 10 years ago. It made me laugh, so I tucked it away into my memory. Over the weekend when I first saw the sketch for challenge #12 at CAS – Colours and Sketches, I thought this sentiment might work for it. The main part of the sentiment seemed like it would fit in the long rectangle, the last three words could go in the small panel, and images of lemon slices could fill in for the half circles. I finally took the time to get it all together with cardstock and ink, and here it is. 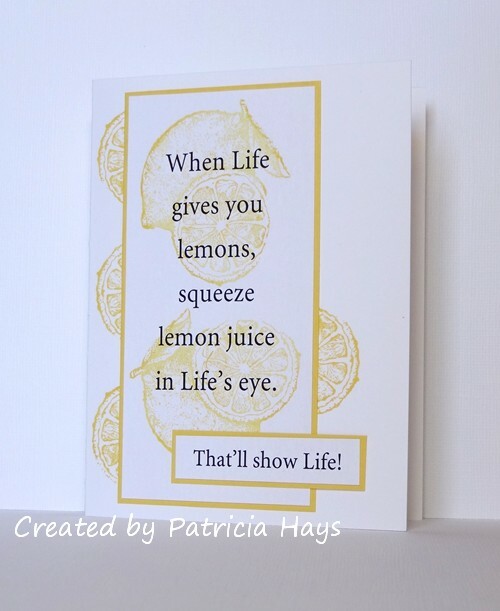 The sentiment is computer generated, and the lemon stamp is one that I’ve had for a long time. 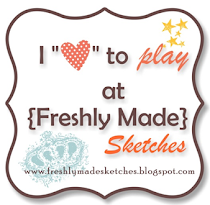 I inked only the cut lemon part of the image when I stamped it for the half circles. When I stamped over the sentiment on the image panel, I stamped off the ink lightly onto a scrap piece of paper first so the yellow wouldn’t be quite so bold against the print. 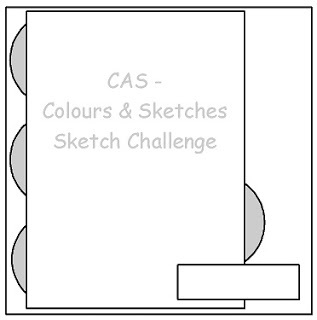 Although I’d already made one card for the CAS – Colours and Sketches challenge, I felt bad about it because I accidentally left an element off of the sketch. So this is my attempt at redeeming my oversight there. The fruit element makes this card work for the February Our Daily Bread Designs challenge on the OWH Stars and Stamps blog. 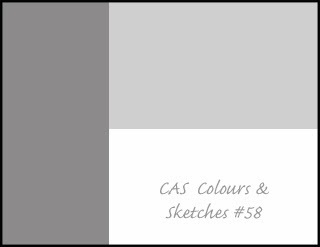 I also had kept the CAS-ual Fridays challenge of black and white plus one other color in the back of my mind while I was making this card. Thanks for stopping by today! And remember, when Life starts getting rough, sometimes you need to give it a back a little attitude of your own. 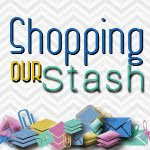 Posted by PH in VA at 2:00 pm Cards, CAS Colours & Sketches, CAS-ual Fridays challenges, Operation Write Home, Stampin' Up! 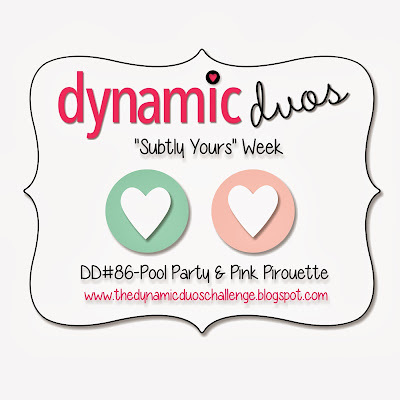 When I saw this week’s color combination for the Dynamic Duos challenge, I knew I was going to have a hard time with it. 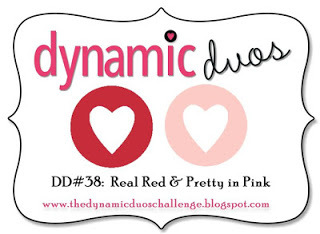 I really like red, and I’m OK with pink, but I don’t always like them paired with each other. But seeing the colors in the prompt for the current Lawnscaping challenge helped, and with the aid of some chocolate brown I pulled the red and pink together. I also wanted to create something for this week’s CAS-ual Fridays challenge to use letters, and I knew I wanted to use this alphabet set for that. It’s not one of my favorite cards, but I think it turned out all right. Today’s card is a blending of three rather different challenges. 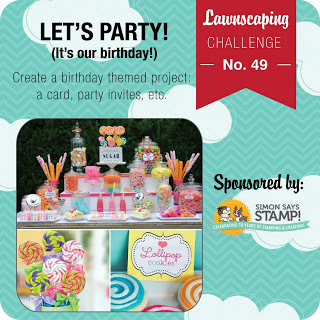 First off, Lawnscaping is celebrating their second birthday, so their challenge is to create a birthday or celebratory card. 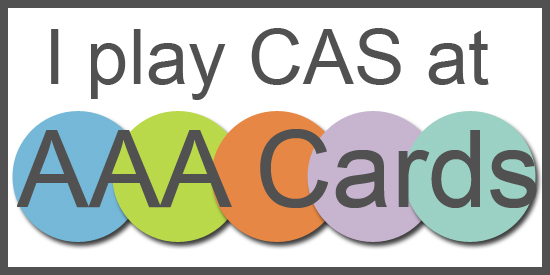 The CAS-ual Fridays challenge this week is to create a card that celebrates an accomplishment, and that contains at least one circle. I think getting through another year and celebrating a birthday can be an accomplishment, don’t you? 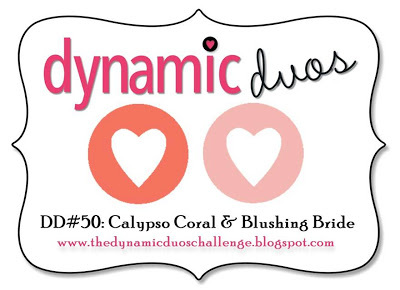 And once I figured which stamps I wanted to use for my card, this week’s Dynamic Duos color challenge lent itself perfectly to creating a little scene. 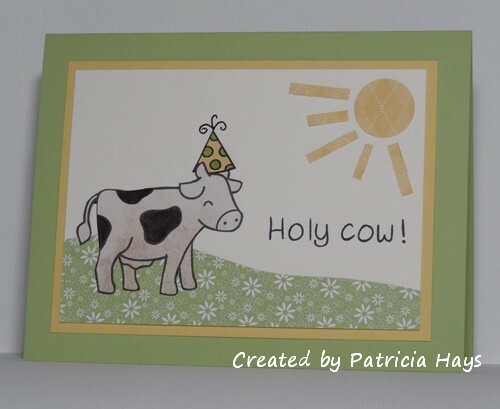 The cow on today’s card is actually a leftover from something I was working on some time in the last year. She’s been sitting on my desk this whole time and I thought it would be cute to pair her with the sentiment “holy cow!” I wanted her to have a party hat to help show off the birthday theme, but I also toyed with the idea of drawing in a halo to go along with the sentiment. In the end the party hat by itself won out. The circle element for the CAS-ual Fridays challenge is the sun, punched from a scrap of designer paper, with narrow scraps added for rays. The scrap of floral designer paper made a great meadow for the cow. I continued the birthday theme inside the card. 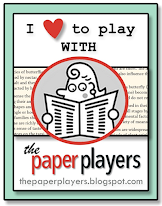 I normally don’t put sentiments inside the cards I make for Operation Write Home. 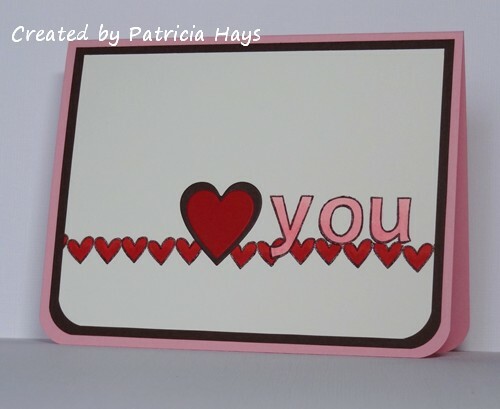 So I put this one up higher than I typically would in a card for my own use, to maximize the amount of writing space for the hero who chooses to send this card to someone. Thanks for stopping by today! And congratulations to Lawnscaping for two fun years of challenges. Keep up the awesome work! 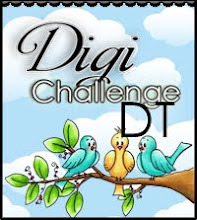 Posted by PH in VA at 10:00 pm Basic Grey, Cards, CAS-ual Fridays challenges, Dynamic Duos, Lawn Fawn, Lawnscaping challenges, Operation Write Home, Stampin' Up! In honor of International Literacy Day on September 8th, Cas-ual Fridays is presenting a challenge to create a CAS card that’s inspired by a book – but there’s a slight catch. You also have to use the colors black, white and red. After giving this challenge some thought, I decided to make a card based on one of my all-time favorite books, A Tree Grows in Brooklyn by Betty Smith. I figured since fall is approaching, it was appropriate to have red leaves. Instead of pulling out my distressing tool, I roughed the edges of the focal panel with my thumbnail to distress them just a little bit. I chose the sentiment for two reasons – it relates how Francie felt after one of the other characters died (I don’t want to give away too much of the story for anyone who hasn’t read it! 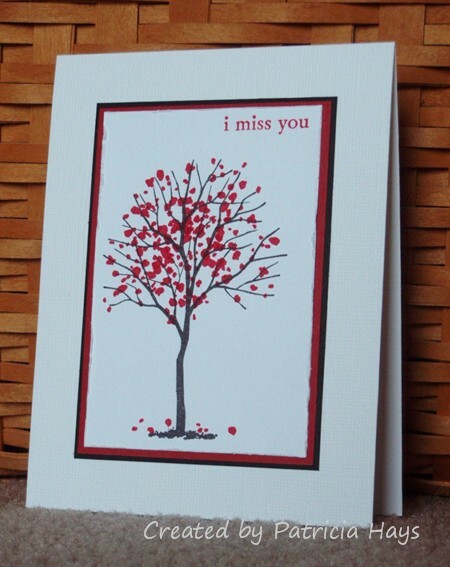 ), and because I wanted to make another “missing you” themed card for Operation Write Home. 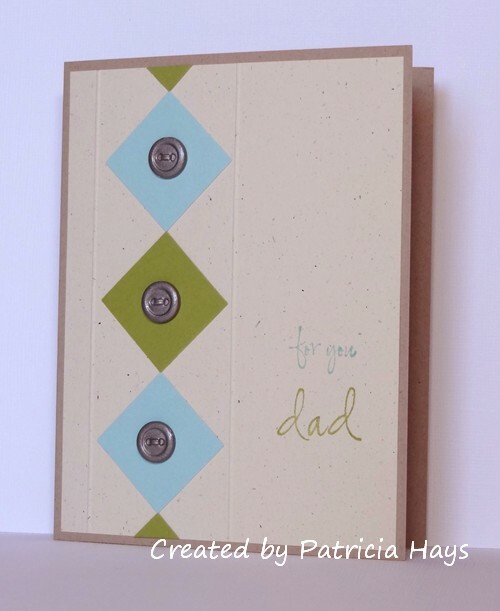 I used textured cardstock for the card base to add a little extra visual interest. 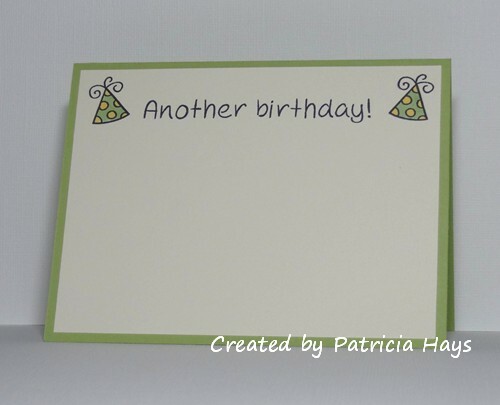 Posted by PH in VA at 12:30 pm Cards, CAS-ual Fridays challenges, Operation Write Home, Stampin' Up! 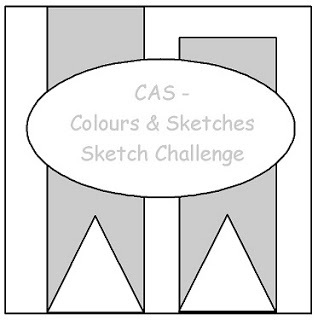 I’ve been eyeing a relatively new challenge blog called CAS-ual Fridays for several weeks, but haven’t had the chance to participate in one of their challenges until now. 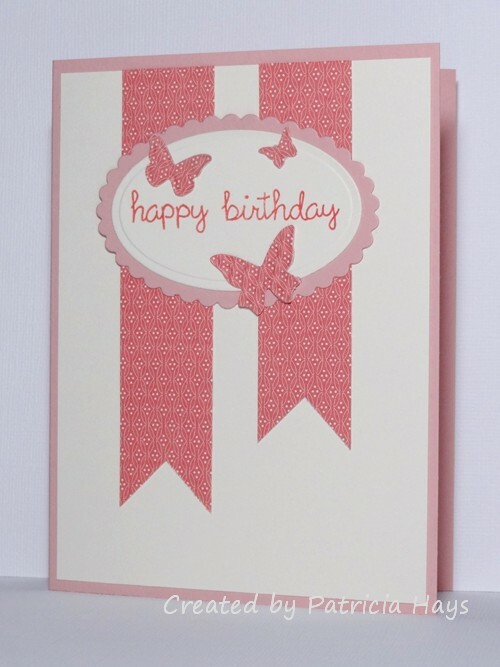 Last Friday’s challenge was to make a 4″ x 9″ card and keep it clean and simple. I have to admit, working with a card about 1.5 times the size of a typical A2 card wasn’t really easy. What I finally ended up with is probably the fourth or fifth variation of the original mental image I had (I lost track). But I’m satisfied with how it turned out. 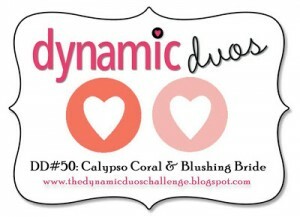 Posted by PH in VA at 8:00 pm Cards, CAS-ual Fridays challenges, Lawn Fawn, Stampin' Up!